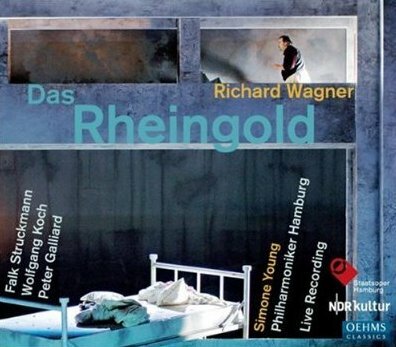 This Rheingold rather bucks the trend of recent Ring recordings. The first instalment of a new cycle, it was taped in March 2008 at the Staatsoper Hamburg; Die Walküre was unveiled in October and will, along with the subsequent operas, be released on Oehms in due course. Whereas most recent Rings have appeared on DVD or SACD, though, Oehms have plumped for good old CD. A lavishly illustrated booklet therfore is all we have to give us an idea of Claus Guth's production – inversion of scale seems to be a feature, the bottom of the Rhine represented by an outsized bed with a lamp to the left, for example – but otherwise we are left to concentrate on the performance's musical values. Thankfully, in Simone Young we have experienced Wagnerian at the helm. I saw her first Ring in Vienna in 1999 – with Simon Estes as Wotan it rather contradicted the city's reputation for backwardness in terms of racial and sexual politics – and in the interim her interpretation, as shown by this Rheingold at least, has developed into an impressive achievement. She paces the score with expert control, allows the drama to unfold naturally and there's the right balance between the stage action and what's going on in the pit. The orchestra could have been asked to whip up more of a storm for Donner at his 'Heda! Heda! Hedo!' but otherwise Young hardly puts a foot wrong. The Philharmoniker Hamburg play extremely well for her, even if they inevitably can't match the sheer quality of sound achieved by some other orchestras in this work. In her own introductory note, Young points out that apart from Falk Struckmann as Wotan and Wolfgang Koch as Alberich, all other members of the cast are taken from the Hamburg ensemble. The intimacy and understanding between the singers that is so necessary, first among the three Rhine Maidens (sung here by Ha Young Lee, Gabriele Rossmanith and Ann-Beth Solvang) and then in the divine extended family lounging around in Valhalla, is here in abundance. Taken in isolation, most of these roles have undoubtedly been better sung several times elsewhere: Peter Galliard's Loge can sound strained in the higher tessitura and at times the giants come across as underpowered (Tigran Martirossian's Fasolt more so than Alexander Tsymbalyuk's Fafner). But dramatic verisimilitude counts for a great deal in Rheingold and these singers gel together excellently. Struckmann is a singer whose vibrato can broaden and whose technique sometimes makes for some strangely varied vowel sounds, but it is a voice full of humanity and warmth; he is an authoritative Wotan and an imposing actor. And despite a recent Amfortas and Telramund in this Spring's revival of Lohengrin at the Royal Opera, he is a singer heard far too seldom in the UK. In Koch with have an Alberich who sings the role without resorting to caricature yet still conveys all the darkness in the character's nature. He is helped no doubt by Young's chilling way with the Nibelheim music and powerful evocation of the curse. Others in the cast include Deborah Humble as a noble and rich-voiced Erda and a youthful Fricka from Katja Pieweck. I felt Jürgen Sacher as Mime could have used Wagner's language more to spice up an interpretation that came across as a little bland. Jan Buchwald as Donner, Ladislav Elgr as Froh and Hellen Kwon as Freia make up the rest of the ensemble in Valhalla with solid if unremarkable performances. Oehms's engineers manage to catch the performance in sound that is remarkably natural, even if it lacks the brilliance we are used to in studio performances of this work. There are the inevitable stage noises but most seem to be generated by various special effects, rather than the singers moving around, and there is nothing that is unduly off-putting. This is a very respectable achievement, then, and one which presents Wagner's masterful score with admirable integrity. It will be interesting to see how the cycle develops.